In this review, we travel through the educational game Mario is Missing! for the SNES. This game was released in 1992 and was one of a set of educational games starring the Super Mario Brothers. The plot follows that Mario was caught by a trap door and it is up to Luigi (with the help of Yoshi) to free him. When you start the game, you appear on the first floor with a portcullis and 5 doors in the first floor. You can enter the doors in any order you like, but in order to complete a floor, you have to beat all 5 of the levels. In total, there are three floors. If you complete all 5 levels, you then square off against one of the Koopa characters. Jump on that Koopa 6 times to defeat him and enter the portcullis to continue on to the next floor. In each city, there are numerous roads you must navigate. You can move up a street wherever there is a sidewalk and street leading away or you can move down a street by finding the sometimes subtle street lines on the road allowing you to cross. Helping you is the city map you can access in the start menu. In each level are a number of Koopa troopers wandering the street. The Koopa troopers are confined to wandering up and down one particular street and cannot travel from one street to the next. This makes for some easy pickings as the Koopa troopers appear on your map as well. One of the objectives is to find the three Koopa troopers with an artifact. You’ll know you’ve stomped on the right one if there is a small animation (either the trooper is flattened, shatters, or bursts into flames) and the fact that they leave a small object behind. Jump up right on top of the item to collect it (???). When you collect all three artifacts (or 1 or two of them), you can run to one of the three information tourist traps located in the city. They will tell you that the attraction is closed because someone stole a particular artifact. She (looking like Princess Peach) hands you a “pamphlet” which tells you the name of the artifact stolen, the cash reward (which I don’t think you really collect), and a paragraph of facts about the attraction in question. If you attempt to hand in the artifact, she’ll ask you two multiple choice questions about the destination (or object) in question. Answer both correctly and you can enter to take a picture of the attraction. Get any of them wrong and she’ll turn you away saying that you obviously have a fake (uh…). You complete this objective if you turn in all three artifacts. The other objective is to identify which city you are in. There’s plenty of hints to go around. The more obscure hint is the architecture in the city (i.e. Mexico has pinata’s in some windows). Another hint is the information destinations located on your map (i.e. the statue of Christ is located in Rio De Janeiro), or the artifacts and pamphlets themselves (i.e. Big Ben and the minute hand is probably located in the U.K.). Once you have figured out where you are, you utilize the Globulator and guide Yoshi to where you are. If you guess correctly, you will not only have the ability to ride Yoshi (who allows you to travel more quickly), but also have the ability to leave the city once you’re done turning in all three artifacts. If you complete a level, you’ll get a city bonus (which I’m not sure what exactly helps this score) and even a time bonus if you complete the city fast enough (which is surprisingly difficult at times). When you complete the game, the score counts for exactly nothing because there didn’t appear to be any high scores tabulated at the end of the game. An element of the game that’s a bit mystifying to me, really. A lot of people who have played this game panned the overall low quality here. Some people did give a thumbs up to the idea of bringing education to entertainment like this. Personally, I do agree with both perspectives. It’s a good idea to at least try to bring some form of education to a game, but when it’s done this horribly, it doesn’t solve much except perhaps dissuade other game developers from bringing education into the gaming world. There are numerous reasons why I personally didn’t like this game. For one, it’s impossible to get injured or die. The worst that can happen to you is that you get bored and switch off the game. Besides possibly getting a lower useless score, there is nothing that will really harm your progress outside of flunking the mini-quizzes throughout the game. So, the enemies don’t hurt you. On top of that, the boss fights are silly in that they just run around waiting for you to stomp on them and put them out of their miseries. Bosses cannot harm you. To add insult to injury, there’s no real final boss. Once you’ve defeated the third “boss”, you get treated to an animation featuring Bowser and little else. Another reason: the quiz portions could have been better implemented. If there was a series of successive locked areas you could access by correctly answering the trivia questions, I think that would have been leaps and bounds better than randomly placed information booths. The quiz’s themselves were fine. The information distributed was fine, but the implementation in the game was poorly thought out. The little bits of dialogue found in game just seemed awkward. The fact that the ladies at the information booths say the exact same thing with a few words rearranged just made the gameplay dry and boring. The games length was short. I would have just thrown the controller onto the carpet and switched off the console out of pure boredom, but I ended up beating the game too quickly for that to happen. The Globulator feature was extremely obscure and difficult to figure out since there was virtually no clues as to what it does in-game. Once I returned the three artifacts, I didn’t know how to make the baddie in the exit pipe disappear until I did some digging around outside the game. The way artifacts are dropped and picked up virtually makes no sense. What is left behind looks like a partial glove of some sort. This tiny little object can be anything from a shield to an entire piece of architecture. What’s more, you jump up over top of it to collect it after. Even running on top of it made more sense to me then jumping. The implementation of Bowser was also pretty badly done in this game. The end game animation made very little sense to me outside of enacting revenge with a trap door (which ends up just being magically appearing ellipse’s more than a door most of the time). While I haven’t played every Super Mario game out there, I don’t recall Bowser actually dying before until I played this game. If you win the game, Bowser really does die. I’ve seen him flipped on his shell, sent down pits, flung out of his castle, beaten repeatedly, and dropped into lava pits (which Bowser can survive from given his enjoyment of burning sulphur), but never actually killed until I played this game. Generally, this game is a great idea in theory in terms of bringing education into gaming, but this was very poorly implemented. Besides the decently written quiz’s and information, there’s very little about this game to praise. I was very easily bored when I played it. There is one bright spot in this game, though. In the area of graphics, I don’t recall seeing so many differently decorated levels in a game. The architecture in the background was decently rendered, but the fact there were so many different sights to see was actually quite impressive in and of itself. The sprites, however, left a lot to be desired. What wasn’t taken from previous games looked off to me. If you see Yoshi go up and down the streets, you’ll notice that Yoshi has no tail going up a street and looks like a green penguin going down a street. Some of the animations within the sprites looked more like poorly executed hacks than something well thought out. I also found it odd that with a game with so many streets, there were no cars even though there were car horns that can be triggered. The audio was somewhat decent, but nothing special. The sound effects were OK and the music was about average, but that’s about it. Overall, this game started on a great theory of being able to bring in education into a gaming environment, but it was poorly executed. I commend the rendering of the many buildings found throughout the game, and the information and quizzes themselves weren’t bad, but everything else had terrible execution. 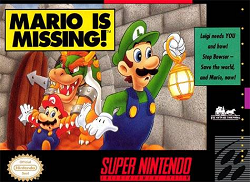 From the bizarre version of Bowser to the odd information booth encounters to the face that scores didn’t really count for much and you couldn’t even die in this game, this game is long on ways to criticize it and short on ways to praise it. As an educational game, this game simply flunks out. Furthest point in game: Nearly quit out of boredom, but won anyway.